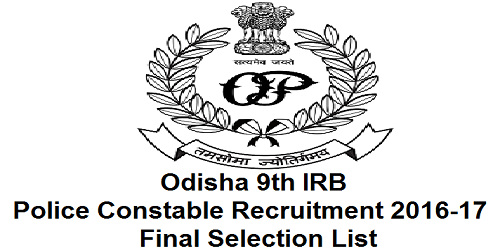 Final Selection list of Odisha 9th IRB Police constable Recruitment 2016-17: 9th India Reserve Battalion (Specialized) of Odisha Police released its recruitment notification in the month of December 2016 and this recruitment is for 521 Police Constable Vacancies in Odisha 9th IRB (Specialized). The last phase of this Odisha Police 9th Specialized IRB constable recruitment process , that is the written exam was held on 9th April 2017. The candidates who were participated/appeared for the final phase of the recruitment process are eagerly waiting to know about their result status of Odisha 9th SIRB Police Constable Recruitment 2016-17 written exam. Lokaseba Adhikara Common Application Portal of odisha state released the final Selection list of Odisha 9th SIRB Police Constable Recruitment 2016-17 on 28th April 2017 in their official website https://lokaseba-odisha.in. The candidates, who were participated in the recruitment process of Odisha 9th IRB (Specialized) Police Constable 2016-17 recruitment up to the last phase (i.e., written test), can check their result status by downloading the final selection list of 9th SIRB of Odisha police 2016-17 recruitment. 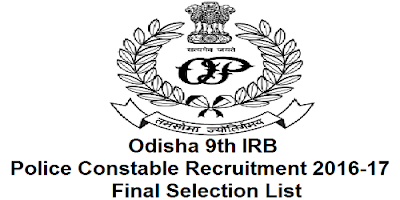 The final selection list of this Odisha 9th IRB Constable 2016-17 Recruitment is given below, go through the link to download the list or visit the official website of Lokaseba Adhikara Common Application Portal of odisha state https://lokaseba-odisha.in. 2. Go through Click to Download Select List of 9th SIRB link which is on right side of the menu bar. 3. The Final Select list of 9th SIRB Pdf file will be opened. 5. After Opening the Final Selection list find out your Roll Number by Pressing Ctrl+F, a small popup window will be opened on top right corner. 6. Enter Your Roll Number correctly and press Enter.